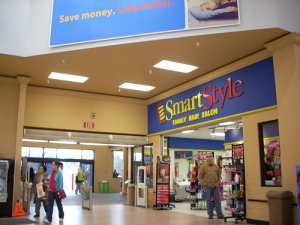 If you have ever been to Walmart store chances are you walked past a SmartStyle Hair Salon. This is because SmartStyle Hair Salon is a hair salon chain owned by the Regis Corporation and is based entirely in Walmart stores. Regis Corporation is the leader in the hair salon industry and of all the hair salon chains that Regis Corporation owns, SmartStyle has become their fastest developing department. So what sets SmartStyle apart from the rest? They offer fast and convenient service where you can enjoy walk-in service at cheap prices. Also, SmartStyle is not for him or her, it’s for everyone. Enjoy a full range of services for the entire family, simply by walking into a SmartStyle Salon. SmartStyle frequently sports rates that even customers can’t believe.Currently, SmartStyle prices are so good that it has an ongoing offer for “buy one and get the second one at 50% off.” for Redken, DESIGNLINE, Paul Mitchell, and Matrix products that will make you look good and feel good. Hair Styles are done by trained professionals who understand the inner workings of making you look good. SmartStyle hair care experts are constantly updating themselves to ensure that you have the best of service! Even if 10 customers walk in, asking for the same style, their experts know that it isn’t just a matter of snapping scissors. Each person’s features are unique, hence, the way to carry out the same style, on two people, would be different. Some of the most popular smartstyle prices include ;adult haircuts with shampoo and dry is priced at $15.95 ($18.95 with express dry), haircuts for children with shampoo and dry is $10.95 ($13.95 with express dry), whereas perms are priced at $49.95, styling inclusive of shampoo at $14.95, specialty styling at $26.95, foil highlights is $49.95, and color is $44.95. What’s more? Walk into the nearest SmartStyle to experience the difference between any other salon. SmartStyle experts stay up to date on latest trends and techniques while using the best of hair-care products!